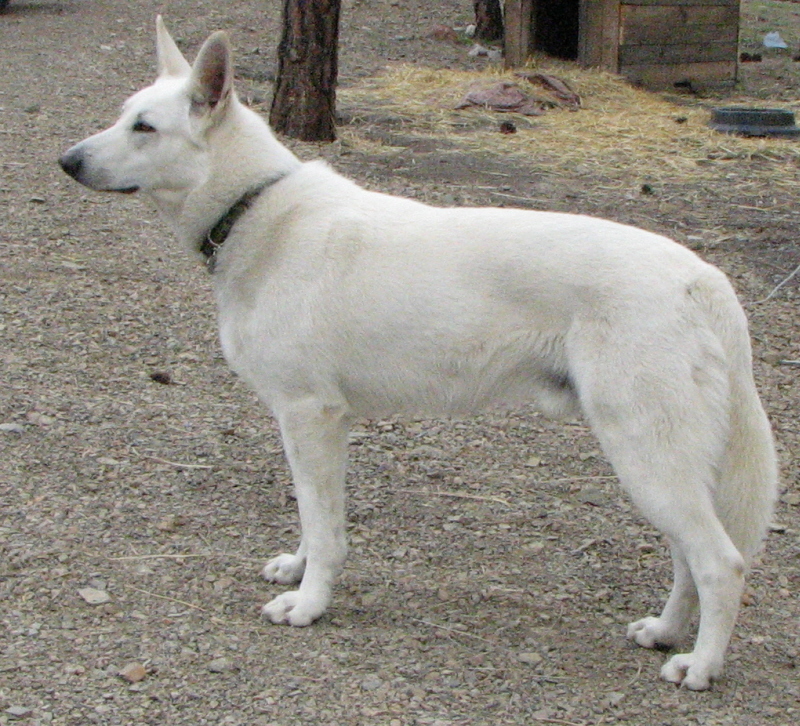 White Shepherds are a rare breed of herding/working dog from Germany and Austria. The breed was first established in Germany when there was a split off from the "German Shepherd" breed. When the "grey" or "dilluting" gene was found to be in the German Shepherd and was becoming dominant, they decided to ban all dogs with white or grey on them from the German Shepherd breed. 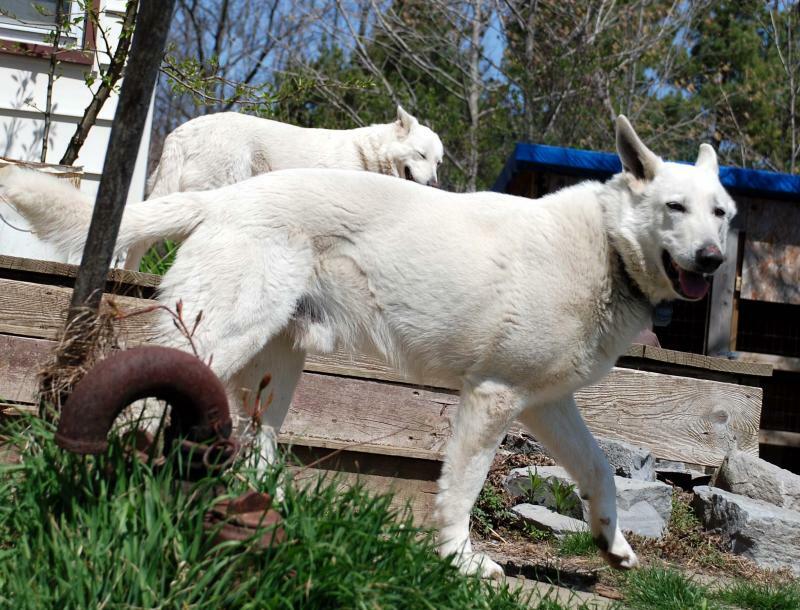 Of course, the breeders who had these dogs were not happy with this and decided to create their own breed registry for "White Shepherds". Now most of the dogs are born completely white. Some have a bit of brown on their ears and a few black hairs on their back, but are primarily white (which is technically gray because they have black skin). This is not an albino variation (pink skinned). We have found one black hair on Luke so far and none on Xena. Luke is a short hair, but his father was a "Plush" or long haired variety. Xena is a "Plush" with a nice thick, longer coat. Luke is registered with the CKC and was born in December 2005. Xena (Princess Warrior) We lost Xena in October 2015. She was my white shadow when in the house with me...and was a road warrior; travelling with us when we had the livestock transport business for several years. She travelled from coast to shining coast and as far south as Oklahoma! RIP our little white princess! We miss you still! Xena was unregistered and born in January of 2005-October 2015. 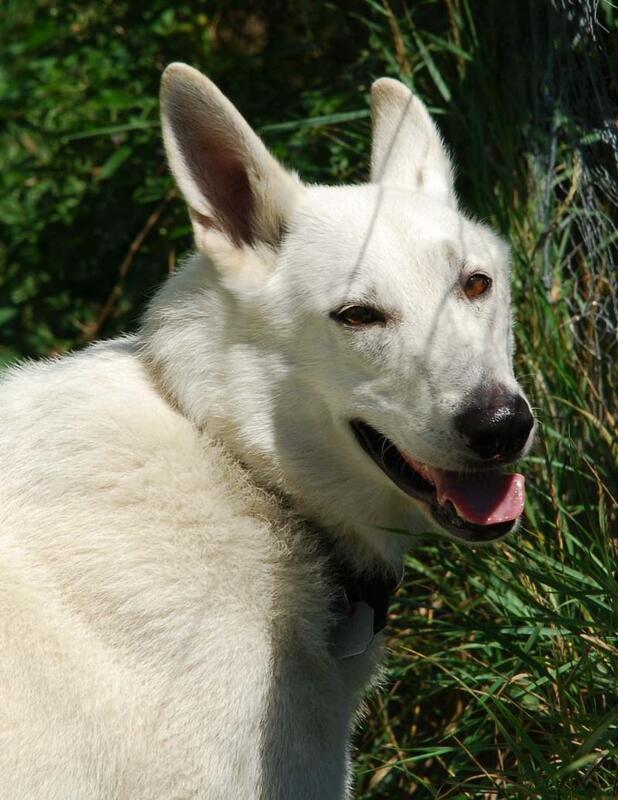 Update: Sadly we lost Xena to bone cancer October, 2015. I miss my friend every day! Xena was very typical of the breed; she loved the water. She was generally aloof with strangers and would give a warning woof sometimes. Although in her old age, she'd become quite lax with her security detail. Lucas is now nearing the end of his life also. He was just under a year younger than Xena and has slowed down. Xrays revealed major arthritis in his back and hips (although you wouldn't know it sometimes). He has trouble standing now. We keep him as comfortable as possible, but he still wants to be with us and wants to go for a walk...all good things must come to an end...this is part of life.We must learn to let go. Luke and Sonia...Luke figured all Sonia's toys were actually for him! Luke is a "ham" and fun-loving boy. At 9 years old, he is finally coming out of his "puppy stage"! He is our security alarm here at the ranch. He lets us know when something is new in the area or there is activity at the barn. The perfect watch dog! Luke and Xena had one litter, Xena is now fixed. The photo above is one of my favorites of Lucas; it really shows his personality. He is a sensitive boy.